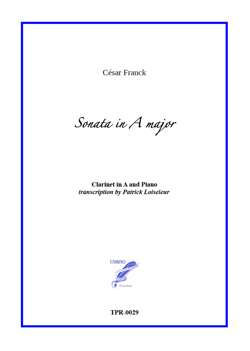 César Franck's famous Violin Sonata in A major is available here in a transcription for Clarinet in A and Piano. Synopsis This is a transcription for clarinet in A of César Franck's famous Sonata in A major for Violin and Piano, written in 1886 and dedicated to the famous violinist Eugène Ysaÿe. The composer did approve a Cello transcription of his Sonata. There is little doubt he would approve a Clarinet version too, if he would live in our time an listen to the wonderful clarinet players we have today. The clarinet in A has been chosen because it fits better the tonality of the whole Sonata.